Spot Bill Toucanet (Selenidera maculirostris) is a native of southern Brasil and northern Argentina, where it is fairly common. It is one of seven so-called lowland toucanets, seldom seen above 1000′ elevation. The Spot Bill (as are its cousins) is small, weighing only 150 grams, with a total length of nine inches. 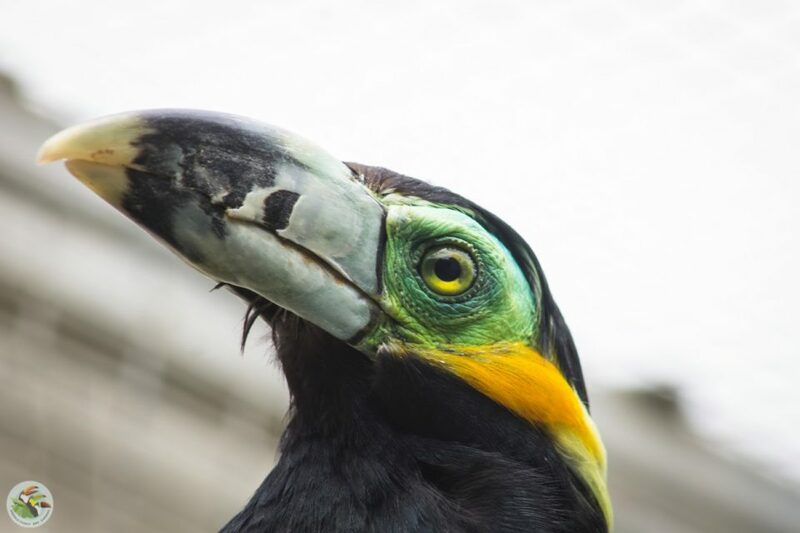 The beak measures only two inches, making it the smallest in beak size. The beak, however, is its distinguishing characteristic as each bird has its own unique pattern of spots, which identifies it much like a human fingerprint. The Spot Bill (as all the Seleniderids) is dimorphic. The male has a black head and breast, whereas the female has a brown head and breast. Spot Bills are free breeders and easily reproduced in the aviary. They are also docile and may be housed in mixed species flights without incident. Spot Bills were imported only a couple times, and in very small numbers. Consequently, most birds available descend from a handful of founders. This has not, however, contributed to any significant inbreeding problems. First captive breeding May 28, 1984; Jerry Jennings. CITES status: Appendix III.